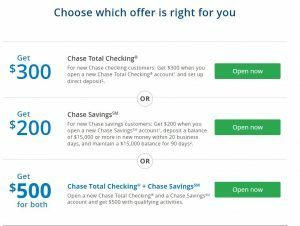 New Chase customers can take advantage of an exclusive offer to earn up to $500 in account bonuses by just switching accounts – offer available at chase.com/startnow. 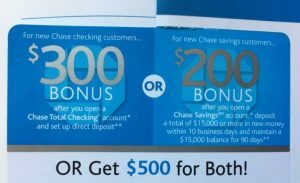 The specific offer is new customers will receive a $300 bonus for opening a Chase Total Checking account and $200 for opening a Chase Savings account OR opening both accounts to receive both bonuses equalling $500. If you received a mailer advertising this offer there are a couple ways to get started – via online or by personally stopping in to your local Chase Bank. When applying online refer to your mailer to locate your 16 digit coupon code. Take your Chase coupon card that is attached to your mailer to a local Chase branch in your area. 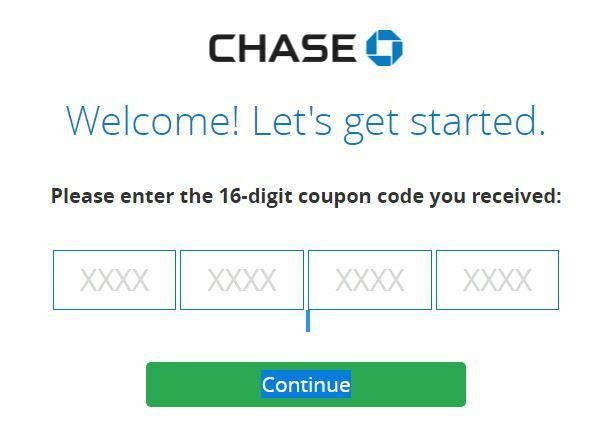 The coupon is good for opening a Chase checking or savings account. It is only good for one time and cannot be transferred to others. There are some specific details new customers need to be aware of when opening a Chase Total Checking account or Chase Savings account. Individuals interested in earning the $500 bonus for opening both a checking and savings account can do so. You will still have to meet the requirements of each.